“By allowing employees to work remotely, you can hire the best of the best while not limiting yourself by geographical restrictions,” says Simon Slade, CEO and co-founder of Affilorama. These tools can help you simplify and organize your internet marketing strategies, so use the resources available to you to improve your campaigns and get better results..
Simon Slade’s three businesses — SaleHoo, Affilorama and their parent company, Doubledot Media Limited — were born out of a desire to help other entrepreneurs beat the 9-5 grind. “Diverse content creates the impression of authority and helps you better take advantage of secondary and even tertiary keywords. It'll also help convince Google you're providing value, not just going after a single keyword..."
CEO and co-founder of Affilorama Simon Slade who has experienced first-hand the benefits of having remote workers at his company affirms this: “By allowing employees to work remotely, you can hire the best of the best while not limiting yourself by geographical restrictions." "If a customer tweets something nasty about your company, view it as an opportunity rather than an insult," says Gina Broom, marketing assistant, Affilorama, an affiliate marketing training portal. "Let them know you're sorry they've had this experience, and ask how you can help them have a better one," she advises. Simon Slade, CEO and co-founder of Affilorama, says he responds to these opportunities "in an effort to help others in the industry by sharing our knowledge and to help promote our companies." For those moments when you have smaller tasks that don't warrant a new hire but that you just can't add to your already-full plate, Simon Slade of Affilorama suggests microcontracting. We've created a list of great books about business for you. Find inspiration and get an actionable path to create a business and life you'll love. Simon Slade, CEO and co-founder of Affilorama: "My best advice for joining the million-dollar-earnings club is to create an awesome product and then continue its growth. Pick a single, straightforward metric, such as sales units or revenue, and aim to beat yesterday's total every day. This growth strategy is both sustainable and manageable." Affilorama was the first affiliate marketing training portal to offer a free membership option, and we offer the most in-depth (and free) video training lessons on affiliate marketing. "Basketball's zone defense suits successful employee management. If you use a man-to-man approach, each employee is responsible for just one facet of the business, which discourages collaboration and innovation. Instead, a zone defense allows staff members to apply their talents on a range of tasks, depending on where their skills can best be utilized…"
Simon Slade, CEO of New Zealand-based affiliate marketing training company Affilorama, offers his employees 16 weeks of maternity or paternity leave and keeps the employee's position open for a full year after he or she becomes a parent. "At the end of the day, our staff is our number one asset, so we really try hard to look after them," Slade said. 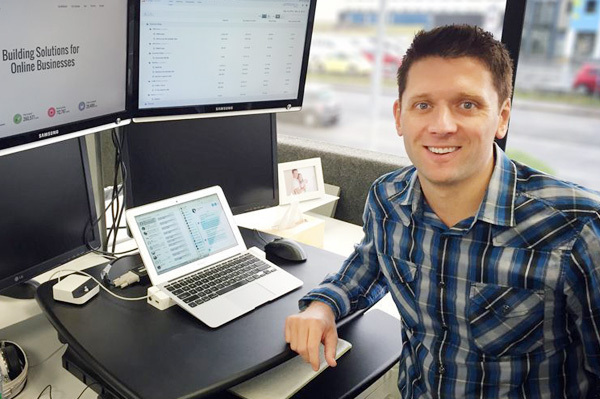 "As CEO of three companies, I am constantly tempted to check my email when on vacation," says Simon Slade, co-founder of Affilorama, an affiliate marketing training portal in Christchurch, New Zealand. "It's easier said than done, but if you're trying to relax on vacation, lounging by the pool or sunning on the beach, try to pick a spot without Wi-Fi so you're not tempted to work." Simon Slade, CEO and Co-Founder of Affilorama, says, "When selecting a domain name, first and foremost, never include a trademarked name, such as sellyouriPhone.com. Secondly, it's unlikely you'll ever acquire the name recognition of Dell, Amazon or other famous companies, so choose a domain that helps explain what the website is about, such as jonesstockphotos.com." Gina Broom says, "Have you got any videos on YouTube at all? If not, have you thought that you'd eventually like to get some videos up? If you answered yes to either of those questions, and you have a website, then bookmark this post, because you're going to need it." You can find out about affiliate marketing opportunities through specific companies' websites or affiliate consolidators such as Share a Sale or Rakuten Affiliate Network. To learn more about affiliate marketing, visit Affilorama, an affiliate marketing training portal. "We use AffiloTools so that issues can be addressed before they become problematic to our customers." "Autopilot" sounds incredibly enticing, and it's true your affiliate marketing websites can earn tremendous income without your assistance. But you must first invest the time, effort and money to successfully establish these profit-making powerhouses. What's the #1 Habit of Successful Content Marketing Campaigns? "Yes, we engage in content marketing to increase sales, but if you allow that to be the focus of your content, potential customers will think you are there solely for your own benefit and won't trust you as a credible source. On the flip side, if your primary focus is providing quality content that potential customers can use and benefit from, you'll earn their loyalty and trust, and sales will naturally follow." If you want to deliver a polished final product, you're going to want to get an exterminator on your side, according to Affilorama's Slade. "This individual ensures every pixel is perfect, that the app doesn't contain a single imperfection," he says. "All kinds of companies, from Amazon to Starbucks to Weight Watchers, are looking for affiliates to help them reach out to new paying customers." ...To learn more about affiliate marketing, visit Affilorama, an affiliate marketing training portal. If you're not blessed with a talent for literary composition, lack the time or are struggling to find new angles and topics for your subject matter, consider one or all of these options for opening the pearly gates to content heaven. We outsource projects and tasks for which we can't justify full-time employment because the work might be limited to 5-15 hours a week. These include media relations, copywriting and video creation, for example. Often we hire freelancers by the project but usually switch to an ongoing basis if we have a great experience with the person. Thanks to Simon Slade, Affilorama! "Professionals who let the fear of failure impact their work don't take risks or suggest unusual innovations," says Simon Slade, CEO and co-founder of Affilorama, an affiliate marketing training portal. "They tend not to make errors, but they also don't initiate grand ideas or make significant improvements." Simon Slade, CEO and co-founder of Affilorama has experienced first hand the benefits of having remote workers at his company, "By allowing employees to work remotely, you can hire the best of the best while not limiting yourself by geographical restrictions..."
"But developing a company after working all day forced me to either take the plunge into entrepreneur uncertainty or put my start-up dreams on hold. I decided to quit and start SaleHoo with only $500 of my own money and $500 of Co-Founder Mark Ling's money. It took eight months before I started earning a profit, but it was well worth the risk..."
"Success is exceeding your own expectations. For one person that might be selling enough online to afford that extra vacation, but for another, that might be earning six figures through affiliate marketing and covering the cost to quit your full-time job and pay off your debt..."
Is Your Social Media Profile Screwing Up Your Job Search? "Finally, "make it easy for your followers to share your content," says Melissa Johnson, content editor for Affilorama, an affiliate marketing training portal. "Make sure that people can follow you on Facebook or Twitter [or Pinterest] directly from your site [by including hot-linked..."
"Mark Ling and I each contributed $500 to a company bank account to start SaleHoo. The majority of our initial expenses, including Web hosting, office space, Internet fees, etc. - we either begged, borrowed the money or promised an 'IOU'..."
"I use AffiloTools for the day-to-day management and monitoring of our websites and spotting problems and fixing them before they get out of control. KissMetrics helps me find out how our core customers are using our websites. Customer.io helps our customers at key moments..."